The energy body, or subtle body, is a system that carries life force energy through and around us, connecting us to the earth, the divine, our higher selves and each other. Understanding this system is crucial for physical, emotional and spiritual health. The energy body is invisible to most of us; however, we feel and react to it constantly, whether we know it or not. This system is made up of several components that work together, just like the other body systems. 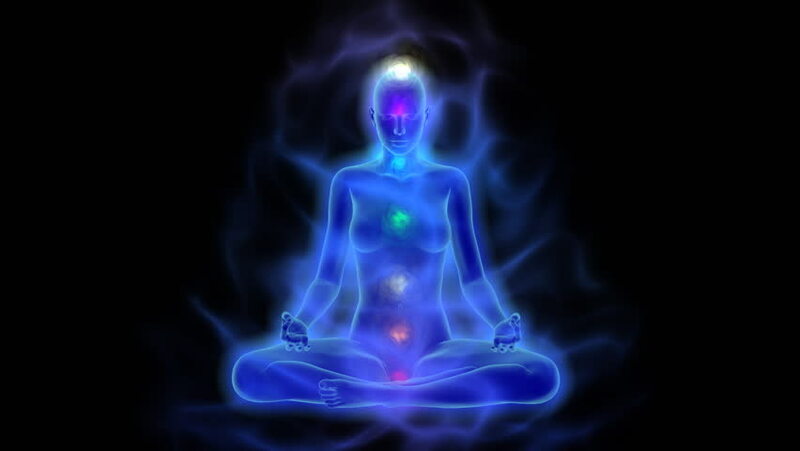 Two major components of the energy body are the aura and the chakras. Everything is made of energy and vibrations. That’s why everything has an Aura. Aura is an energy field that reflects the subtle life energies within the body. 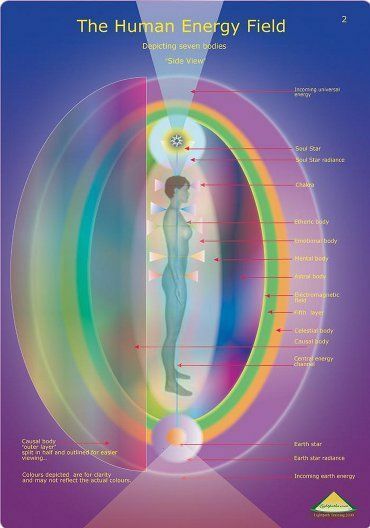 It’s a personal electromagnetic energy field around each of us shaped like Eggshell.Basic Aura looks like layer of Light covered body from 2-3 inches. But it can extend. You can see colors in extended part.It is a reflection of the body’s spirit energy. It reflects our health, mental activity & emotional state. It also shows disease – often long before the onset of symptoms. The aura is simply the energy field around the human body. The aura is often depicted as a “glowy” egg. The aura is your personal space or bubble. The aura is a field of electrical energy that extends out from your body in a bubble. It is made up of layers of energy that emanate out from your chakras. When viewed by someone who can see auras, it has color, based on the vibration emanating from it.The aura changes constantly in direct relationship to your physical and emotional state. It serves two very important purposes: protection and information exchange.You will often recognize or feel it when someone comes too close to you – infringing on your personal space. If you have had your aura picture taken, you will know that each person’s aura presents as any one of the rainbow colors. The Aura can be considered as a ‘mirror’ that reveals our present mental, physical and spiritual state.We all have an aura – whether we can see it or feel it or not. The aura is made of a more “subtle” substance than is the physical body, but this does not make it any the less real, or in fact any the less physical – it is simply physical in a different way. The aura is affected by all kinds of things: the way we think, who we talk to, our environment and so on.Aura is the energy field that surrounds your body. It has seven layers to it. The layers are not perfectly “layered” on top of each other, but blend into one another. The condition of the aura affects the condition of the physical body, and vice versa. All living things have energy, therefore, have an aura: people, plants, rocks, and even your fuzzy little pet. Your aura is a barrier of energy between you and the rest of the world. When it is healthy it gives you a sense of security, insulating you from the energies around you. You have clear boundaries and can tell the difference between your own needs and emotions and those of others.When it is unhealthy you feel anxious, attacked, like the energy of everyone around you is bearing down on you. You have poor boundaries with other people and tend to take on the emotions and problems of other people.Aura health is key to emotional health. The human need for security is fundamental, we cannot function past survival mode without it. Having a strong aura provides you with an inner knowing that you are safe and protected and can go out into the world and take risks, seek what you want and succeed. Auras are fields of luminous energy that surround a person like a halo, and can be seen or detected by those with intuitive abilities either with their physical eyes or their third eye (i.e. mind’s eye). Auras contain various colors, and the master intuitive can detect a person’s dominant energies by the color of their aura. Each color conveys a different meaning. When I was a child a psychic told me my aura was yellow and that meant I was smart, logical, and inquisitive. Over the years my aura changed to green and purple which I was told meant I was spiritual and compassionate. Sometimes I was told my aura was purple around my head and yellow around my body. It seemed my aura was like a mood ring and changed colors with my emotional state. Your aura serves as an interactive field of information. You use it to exchange information with everyone you meet. It is like a virtual business card that instantly shares your mood, your overall health, your intentions, your sense of yourself and much more with everyone you come into contact with. You receive this information from everyone you come into contact with. You may not realize that this happens, but if you think about it for a moment you will remember experiences where you just “knew” something about someone else. Have you ever met someone and felt instantly drawn to them, like you already know them or want to get to know them better? Or, have you met someone you instantly disliked, felt suspicious of, or were afraid of? Where did this information come from? You “read” their aura with your own.We can feel our auras and sense changes in them with our physical senses. This is primarily an unconscious action, but is key to our relationships and personal safety. Auras can be affected by the energies of people around us. If you’re having a conversation with a person who is intimidating you, likely your aura will shrink back as the other person’s energy pushes against it. If you’re feeling powerful and unstoppable, your aura will be thick and strong, and it’s unlikely you’ll feel intimidated by another’s energy. When you’re in love, your aura will reach out to lightly brush against the aura of the person you love, and they will combine to create a field of light around the two of you . As you move apart, pieces of your energetic field will remain with your loved one.Learning to intentionally read and trust what your aura is telling you is a skill that can lead to success in your relationships, career and beyond. Some people have natural abilities to see the aura, but it is a skill that can be learned by everyone. There is less value in “seeing” the aura visually, and more value in learning to intentionally “feel” and interpret the information that is coming from someone’s aura. People with powerful auras will have a lot of charisma. Celebrities or politicians are a good example. Anyone that has a strong presence, who can draw a crowd, likely has a thick aura. On the other hand, people who are fearful, anxious, or shy will often have a very thin aura. If you are unhealthy, there may be areas of black in your aura. If you are meditating or doing spiritual work, you could emanate gold, white, or purple energy. If you are practiced at energy work, you can also inject colors into your aura when you need them. Yes, you can manipulate your aura to send off subtle, or not so subtle, cues into the atmosphere. If you’re about to make a big sales presentation you might want to inject some red into your aura. If you’re about to break up a fight, you might want to inject some gold or green into your aura. What you emanate can influence someone else so emanate responsibly. The human aura extends out several feet around the body. Our aura is the energetic field that emanates from your body and indicates your general mood, state, or way of being. It can be adjusted consciously if you are practiced and skilled at energy work. It can change quickly based on your current situation.Rocks, not so much. Why? Because humans are much more complex than a rock, which means our aura is much more strong than the aura of any other living thing. Your aura tells a lot about you – like whether you are tired, happy, friendly, logical, depressed, etc. 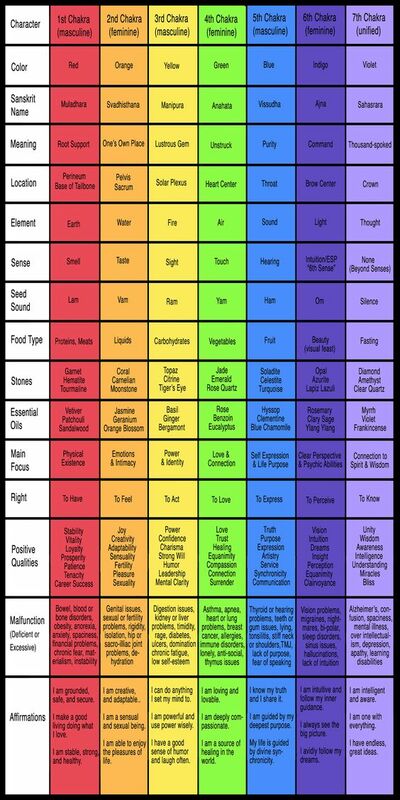 It’s like reading a map of energy.The colors of the aura and shades of intensity vary with emotion that you are currently projecting. Intense feelings = intense colors. Your aura can look healthy and vibrant and sparkle, or it can look unhealthy and have visible “holes”. Our thoughts and emotions as an expressions of the electromagnetic waves affects our chakras and auras. When we are feeling positive and passionate, and decisions are easy, our chakras spin and energy flows effortlessly. Our aura layers shimmer with aliveness. But we don’t always feel like we’re walking on sunshine. We get stuck. We get headaches. We feel overwhelmed. We ponder; we fret; we wonder; we hope.It’s during those times that your chakras spin more slowly and sometimes stop or get entirely blocked. This affects your aura and causes it to look less vibrant and healthy.Our chakras and aura colors are externalizations of the expressions of our thoughts, our feelings, and our moods or disposition. No matter what color the aura is, each aura is made up of the same number of layers. Each layer will vary in depth and clarity, depending upon the individual. Commonly, seven layers are described – and often can been seen with the naked eye. Some can see up to nine layers, and more layers are possible but have yet to be identified. 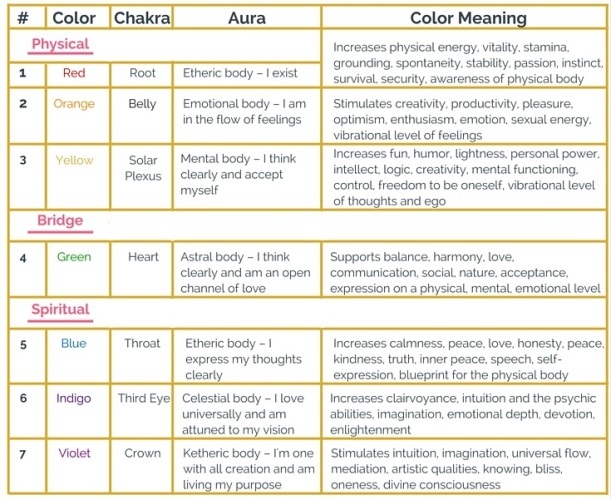 Each layer is associated with a chakra. On this site, the layers will be numbered from 1 through 7, with 1 being closest to the body and 7 being the farthest from the body. The odd numbered layers tend to be structured, whereas the even numbered ones are more fluid – gaseous, flowing, and shimmering. Each successive layer is considered to have a higher vibration than the one beneath it – resulting in a flow of vertical energy that pulsates up from above the body outward to edge of the aura (which could be as far as several feet, depending upon the health of the individual). The etheric layer extends one-quarter to two inches beyond the physical body. The etheric layer is the matrix upon which all physical matter / body tissue is anchored. The layer will appear as a bluish gray haze or more properly sparks of blue or gray light moving around energy lines. The energy layer pulsates around 20 cycles per minute. The layer’s color ranges from blue to gray – gray representing a more robust, athletic type of person and blue being associated with a more sedentary person. The emotional layer is associated with the person’s feelings. The layer is fluid / gaseous in nature and extends one to three inches beyond the body. The color of the layer can be quite bright or contrast very muddy. All the colors of the rainbow can be found here and this layer is where the chakras can most easily be seen. The mental layer is a more structured layer, extending three to eight inches from the physical body. This layer is usually first seen as a bright, yellow light radiating around the head, neck and shoulders of the person, but extending around the whole body. The light will appear stronger and pulsating when the person is concentrating on mental tasks. Depending upon the thought, colored sparks may emanate from this layer. This is the layer associated with thoughts and mental processes. This colorful gaseous layer extends one to one and a half feet beyond the physical body. The astral layer is where astral cords are formed. It is the layer infused with rosy pink color when love relationships, plutonic or intimate, are formed. The chakras are often visible here, but are infused with a pink shade. The etheric template layer is more structured and extends one and a half to two feet beyond the physical body. This layer holds the blueprint / template of all that exists on the physical plane. The layer is a negative photograph template of level 1, the etheric level. All physical forms are here on the template level. The celestial layer extends two to two and three quarters feet beyond the physical body. This layer is the level of emotional love on the spiritual plane. This layer is harder to see, as its colors are shimmery and pastel in color – some people describe the color as “mother of pearl”. This layer is the level which expresses one connection to God and where unconditional love flows. The ketheric template layer extends two and a half to three feet beyond the physical body. This layer is where we know we are one with God. This layer is the strongest, most resilient layer of the aura. The layer is composed of rapidly pulsating golden chards. The cosmic plane is comprised of an unknown number of layers – at least two. These layers are crystalline and shimmery. The function of these layers has yet to be explored or agreed upon. 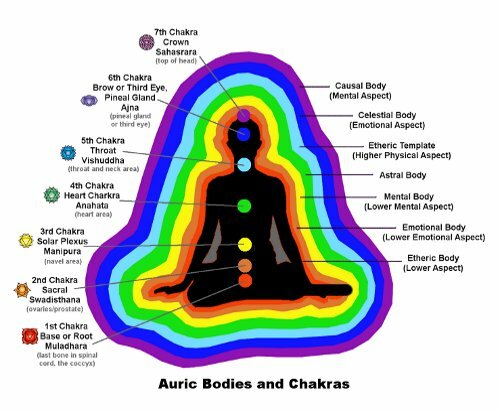 LikeAuras, Chakras also come with specific spiritual colors. The word Chakra is derived from the Sanskrit language meaning spinning vortexes of energy. The chakras are energy centers in the body that correspond to different areas of physical, emotional and spiritual functioning. There are seven main chakras, although there are many more, smaller chakras throughout the body, as well as above and below the body. The chakras are connected to one another through channels of energy that run throughout the body.This energy comes from your connection to the energy of the earth below you and the energy of the divine above you. There is a constant cycle of energetic breath in the body, new energy being introduced and old energy being released. The chakras are thought to vitalise the physical body and to be associated with interactions of a physical, emotional and mental nature. They are considered loci of life energy, or prana, (also called shakti, or chi), which is thought to flow among them along pathways called nadis. The function of the chakras is to spin and draw in this Universal Life Force Energy to keep the spiritual, mental, emotional and physical health of the body in balance. Chakras are energy centers located in the body with corresponding locations in your ethereal or astral body that act as conduits or connectors between you and Source. Each chakra is responsible for a different aspect of Source connection.In a nutshell, chakras are energy centers in the body.Chakras are multi-colored, beautiful spinning wheels in our energy fields. Chakras show you the flow of energy throughout your endocrine system based on what you think and feel about your life at any moment in time. Our chakras are points where energy transfers. Chakras are a powerful connection between your body, your etheric body, and Source. Keeping them healthy and clear will bring you balance, good health, and stronger intuitive connections. Just one minute a day is all it takes. Take care of your chakras and allow them to help you reconnect with Source. Function: This chakra represents the physical, root, survival, security, your base. Your root chakra is the foundation of your energy body. It sits at the base of your spine, in the center of your body and runs down your legs to the bottoms of your feet. It is generally viewed as being the color red, although there is variation: no two energy bodies are the same. Your root chakra is your energy connection to the earth. It is a conduit, drawing life force energy from the earth, into your body to support physical function. It is the center of safety, security and stability in your life. When it is balanced you feel a strong sense of security and groundedness that allows you to try new things, take risks and enjoy your life. When it is out of balance you may feel afraid, insecure, and the need to manipulate or control things in your life in order to feel safe. Function: Emotions, sexual energy, creativity. Your sacral chakra sits just below your belly button and is the center of creativity and emotional expression and core beliefs in your life. It is usually some shade of orange. Balance in the sacral chakra brings a sense of joy and fulfillment to life. You are confident in who you are and know that you matter. You can express yourself creatively and you are flexible. When the sacral chakra is out of balance you feel stifled, you question your worth and can be rigid and judgemental of yourself. Function: Personal power, control, freedom, mental energy. Your solar plexus chakra is at the base of your sternum. It is usually yellow and is the center of personal power, will and self-esteem in your life. It is your powerhouse, and governs how you extend your will into the world. When it is balanced you are confident and strong and you stand up for what you want. When it is out of balance you can feel weak, allow yourself to be controlled by others and lose sight of what you really want. You can also become defensive and angry, using your will to control those around you. Function: Love, compassion, empathy, healing. Your heart chakra is in the center of your chest. It is the center of love and all relationships in your life, especially your relationship with yourself. It is pink or green or some combination of both. When your heart is balanced you have a clear balance between giving and receiving in your life. Your relationships are nurturing and supportive and you have good boundaries with other people. When the heart is out of balance you may withdraw from relationships to protect yourself, give too much, have poor boundaries and resent your relationships. Your throat chakra is the center of communication in your body. It governs honest communication, active listening and self validation. It is generally a shade of blue and is in the hollow of your throat. When your throat is balanced you speak up for yourself, share your needs and feelings honestly and are willing to hear what other people have to say. When it is out of balance you may hold your emotions and needs back, be dishonest about how you feel, or lash out when you feel discounted. Function: Intuition, psychic abilities, clairvoyance. Your third eye is in the center of your forehead and is usually indigo or purple. It is the center of intuition in the body. You receive intuitive insight here, although intuition is actually perceived and processed in many areas of the body. When your third eye is balanced you have a strong sense of things, you see, hear feel and or know truths that guide your life. When your third eye is out of balance you question your intuition, try to prove it or rationalize it away. Function: Consciousness, connection to the divine. Your crown chakra is on the top of your head and is violet/white. It is the center of divine connection and your connection to your higher self. When it is balanced you feel connected and safe; you know that there is something bigger than you watching out for your well-being. You feel a strong sense of who you really are, beyond just the mundane of this lifetime, a strong sense of connectedness. When your crown is out of balance you may feel insecure and small, experience symptoms of anxiety and depression and feel as though you are disconnected. Think of them as distribution warehouses for energy and our chakras can channel energy to where it’s needed in your system. Your chakras can become blocked, just as your mind becomes blocked when you are working through a challenge in your life. In fact, the chakras can indicate where your emotional blockage is, so you can dive on in there fix it. It’s really powerful stuff! Some people can even see chakras and auras. You can develop your intuitive gifts to the point where you can see them, too. The condition of your chakras (how they spin, if they are open or closed, etc.) form your aura. A chakra is literally – from the Sanskrit – a spinning wheel. 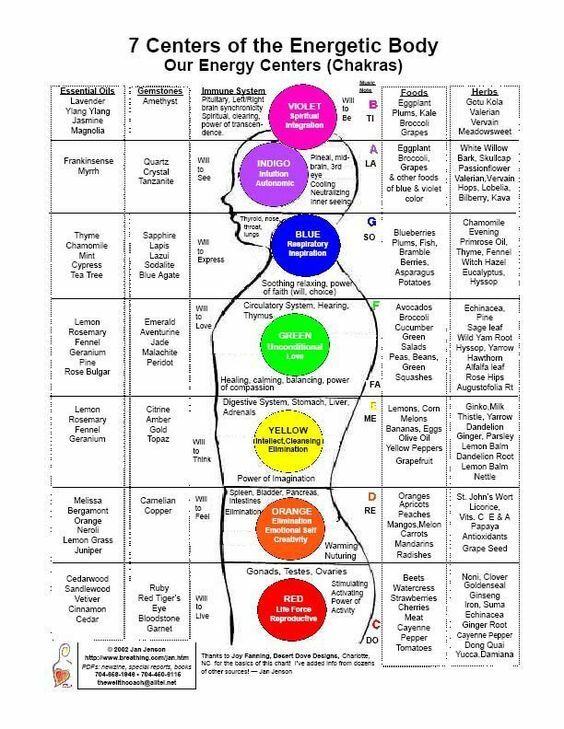 Although typically represented as a vertical row of rainbow dots along the front center of the body, each of the in-body (lower 7) chakras is much more than a colored dot. Viewed front on, each chakra is actually a spinning wheel of color – a vortex. The chakras are simply energy processing centers for the body. Whereas our physical organs process our physical matter (nutrients, blood for example) our chakras process our emotional matter ( security, love etc). 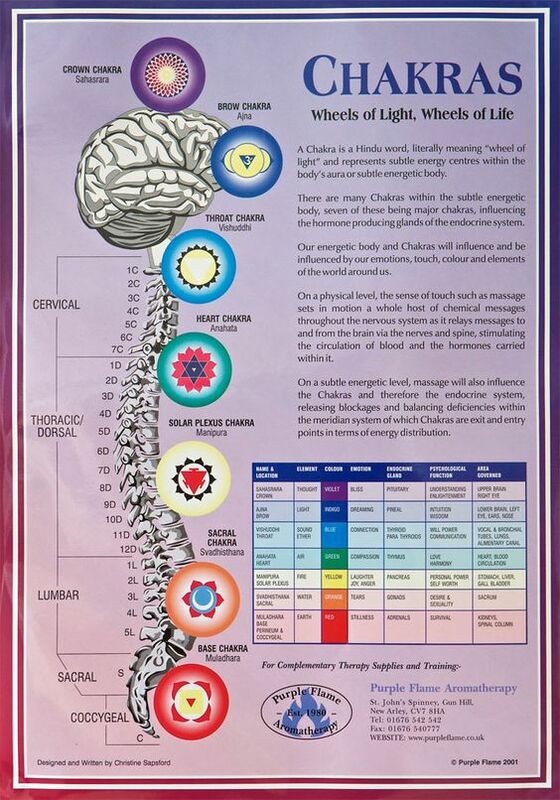 The body has hundreds of chakras funnel like vortexes. Commonly North Americans acknowledge 7-15 of them. A 12 point system is presented here.Viewed sideways, a chakra appears as a funnel. Actually, each chakra is comprised of a number of small funnels (tube like vortexes). Each of these mini funnels has it’s own pigment which combined with the other mini funnels blend to make the chakra’s color. So, if one of these minis is off, so is the entire chakra. Likewise, each mini has its own vibrational rate. All vibrating correctly, they make the chakra’s tone (like a choir). If any mini fails to carry its proper vibration, the vibration of the entire chakra is faulty. Each mini carries one aspect of the chakra of which is a part. For example one of the minis of the base chakra would be the belief you have the right to live, another would be knowing your need for food is met, etc. Therefore, it takes only a very small part of the whole to go awry to send everything out of balance. Each chakra has a lot going on for it. It must be in synch with itself plus all the other chakras in order for the body to function optimally. To be healthy in the physical body, it is important to keep each chakra clean, open and in balance with those around it. There are numerous approaches to chakra wellness. Some include meditation, color, vibration, toning, chanting. For the most part, the metaphysical world has ignored the rear of the chakra system –or marked it with the same color dots as the frontal system & assumed that by treating the front, the back is also treated. Consequently, most healers balance and treat the chakras from the front side only. What a pity! The rear side of the chakra system is a power house that we let lie dormant. The back chakras differ from the front in two major ways. Firstly, the front holds the present and the future as well as the current symptom of function/dysfunction. The rear holds the past as well as the cause (genetics, past experience etc). Secondly, the front holds logic & the limitation of the human plane. The rear holds limitlessness and freedom from earthly constraints. In a nut shell, the front of a chakra deals with the conscious (& present) whereas the rear deals with the unconscious (&past). For example, we know the first chakra (front) to be the seat of our survival energy “I Am”. Looking at a dysfunction here might show suicidal tendencies – the present. Looking at the rear of this chakra shows the past — belief system, family patterns that are the basis for the current (faulty) expression of the base chakra. How much easier and effective to discover and deal with the root of the problem in the rear chakra as opposed to the perceived undesired behavior in the front of the chakra. The front of the chakra responds to energy in a tangible “must follow the laws of physics”‘ way. Whereas the rear of the chakra processes energy in a fashion unlimited by our conscious mind. For example, if you want to get an apple, front side energy would process this by having you go to the store to buy one or climbing a tree to get one. Rear side energy would have the same end result of you having an apple but you may get it because one falls off a tree in front of you, a neighbor drops by with a basket of apples or one just shows up in any number of ways. People who live with the back side of their chakras opened are the ones that “get all the breaks”, draw abundance on all levels etc. So, as you can see, the back and rear sides of the chakras are not identical but complementary. The symptom that manifests in the front side of the chakra is merely an extension of the belief that is held in the rear of the chakra. Both sides must be dealt with for health and balance. 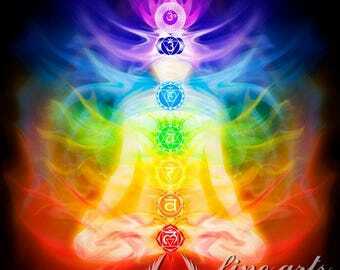 The Auras and Chakras together constitute the spiritual colors of an individual. Both Chakras and Auras are vital to an individual’s health and well being. Both these channels of energy can get ‘clogged’ due to stress or illness and impact overall health. 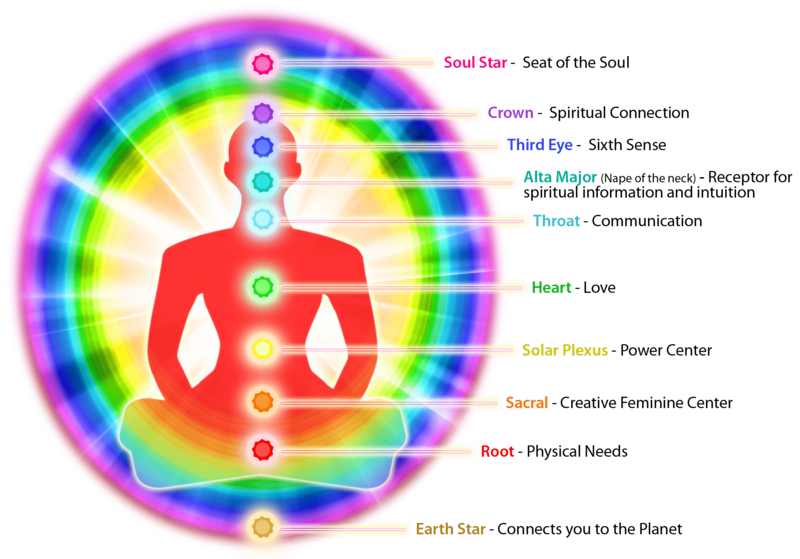 Certain forms of meditation, Reiki, Tai Chi and other sciences from across the world help relieve blocked Chakras and purify Auras to restore health and well being. 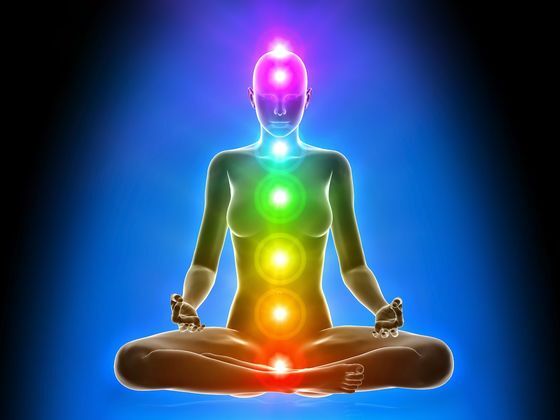 The size, thickness and shape of the auras and chakras identify many things about a person. Stronger and powerful the Aura, more alluring or fascinating the individual is.The Aura spiritual colors change with one’s mood and intent but the chakras spiritual colors are more deeply anchored and remain constant. Only a major life event can change the color of one’s Chakras. 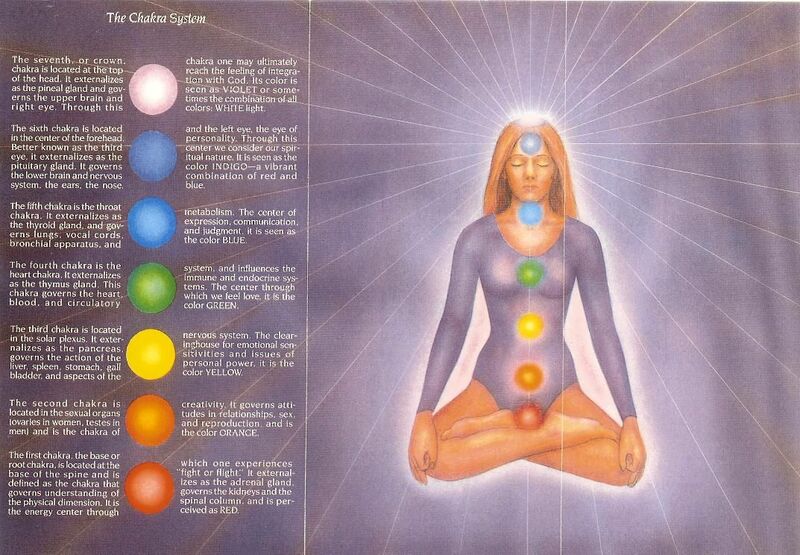 Furthermore, Auras are on the outside while Chakras are internal. Erin mainly views the Chakra spiritual colors of her clients in order to identify the roots of their problems. Your aura is an electrical field of the energy that emanates from each of your chakras.The health of your aura is in direct relationship to the balance of your chakras. They are connected to one another on a very deep level. Your aura projects out into the world the information that your chakras are emanating. If you feel grounded and safe in your root chakra, you project that out from your aura, if you feel weak and insecure in your solar plexus, you project that out into the world. The aura is a combination of all of the information coming from your chakras and it changes as your mood, emotional health and spiritual connection change. There are many factors that affect the health of your energy body as a whole. Seeking balance in your chakras is key to the health of your energy body. There are many ways to balance your chakras. Taking good care of yourself physically, seeking emotional support and having a regular spiritual practice are all very important. Color does not exist in real life. It is just the effect of electromagnetic waves registered by our brains and eyes. Yet it plays a very important role and we simply cannot imagine life without it. Color creates feelings and moods and it is owing to these features that designers and homeowners need to utilize it wisely in order to create an appropriate atmosphere in a given space.Each color has significance on a physical, emotional, mental and spiritual level. The color of the Aura is based on frequency (cycles/second) of light energy. For this reason, the Aura may, and often does, change color, as the movement of light particles in the auric field responds to external forces. Indigo: The color of the seeker who has inborn psychic and intuitive abilities. It represents an astounding ability in the handling of practical matters. Blue: Balanced existence, sustaining life, eased nerve system, transmitting forces and energy. People with blue strong point in their Aura are relaxed, balanced and feel ready to live in a cave and survive. Green: restful, modifying energy, natural healing ability. All natural healers should have it. People with a green strong point in their Auras are natural healers. Yellow: joy, freedom, non-attachment, freeing or releasing vital forces. People who glow yellow are full of inner joy, very generous and not attached to anything. Orange: uplifting and absorbing. Inspiring. A sign of power. Ability and/or desire to control people.